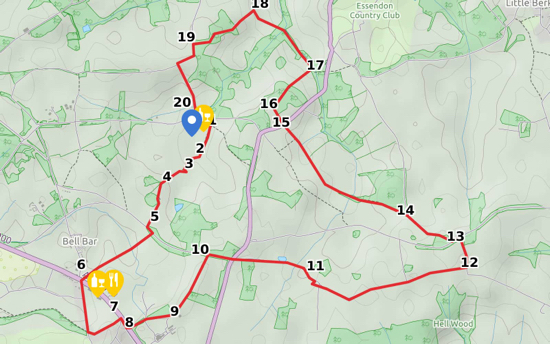 A good walk for views over the south Hertfordshire countryside, via quiet footpaths, lanes, and woodland, with the start and finish at The Woodman Wildhill. 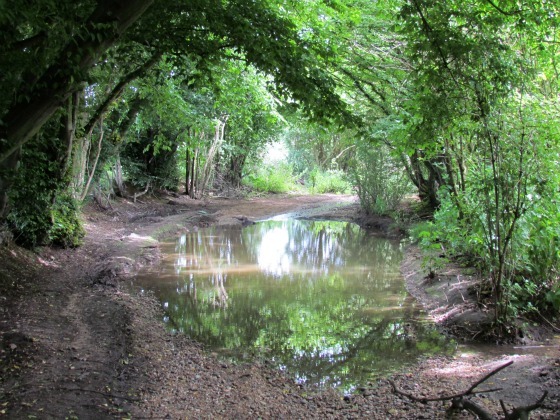 This is a great circular walk starting and finishing in The Woodman Wildhill car park. Leave the car park via the gate at the south end. Cross the field, go over a footbridge, through another gate, across another field, another footbridge, turn sharp left, go through another gate, and emerge into a large field. Soon you will see a path to your left cutting diagonally through the crop and climbing to the top of the hill. At the top, follow the path with the woodland on your right until the path goes through the crop and emerges at a gate on Grubbs Lane. Turn left and, almost immediately, turn right onto a footpath that cuts through the crop, goes over a small footbridge, cuts diagonally across the next field, through a small cops (at this point, look out for the remains of the WWII Tett turret on your right), across a third field and emerges on Woodside Lane by the garage on the A1000. Turn right on the A1000 for a short distance looking out for a footpath sign to your left. Cross the road with care and head down this footpath with the Brookmans Park Transmitting Station on your right. You eventually reach a small footbridge and your way is straight ahead, keeping the hedge on your right and the field on your left until you emerge on Grubbs Lane. Turn right and continue along Grubbs Lane until you reach the B158, Kentish Lane. Cross the road and head down the lane directly opposite as it heads east. Continue until this lane reaches a farm. When you reach the barn, turn right and go round the barn. When you pass the barn go diagonally to your left to reach the path that continues along the ridge. Keep heading east along this bridleway until it reaches a T junction. Turn left and take this path until you reach Tyler's Causeway. Turn left on Tyler's Causeway and, soon after, turn right up Cucumber Lane heading north west. Continue along Cucumber Lane until you see a footpath sign on your left. Take this path, Hornbeam Lane, and continue through the woods until you reach the B158 again. Cross the road and go down the bridleway directly opposite. When you reach a T junction in the paths turn right and follow this path down through the woods, through the fields and into a dell. At the bottom, turn left and continue along this path. 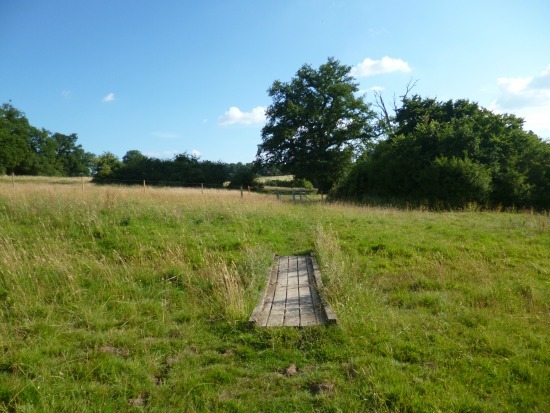 You will cross a small footbridge and climb up the field with the hedge on your right until you meet the BOAT (byway open to all traffic) from Wildhill to West End. Turn left and follow the track until you reach West End Lane. Turn left and follow the lane downhill to Wildhill. At the T junction turn left and head back to The Woodman car park.